I bought my set of rigger boots for under £30, the same are currently £31.99, the lining has not detached, but the inner sole has loosened and lifted, its the Dickies rigger at Wickes. From what you describe it sounds like the lining has become like a sock attached to the top seam and twists trying to strangle your foot into the boot. Gloves – use nitrile disposables, Hive tools etc, for both dip tools and gloved hands into a bucket of washing soda solution between each hive – thats now the new policy at my local association after EFB. I’m also a Rivers Trust Trustee, an Angler (committee member), do Riverfly Monitoring (i.e. kick sampling for invertebrates) , Virkon S does run a little expensive if you buy it in sachets, it has to be in 5Kg tubs minimum to be cost effective. Update … after a further 6 months use the liner detached completely and the heel cup on one boot disintegrated. After walking just a short distance my heel was cut up badly … I’ve chucked them away. When they worked and were intact they were great. Once they started to fall apart they were rubbish. I’m still looking for something suitable to replace them with, though the last couple of months have been so wet I’m currently having to use knee boots to visit my apiaries. 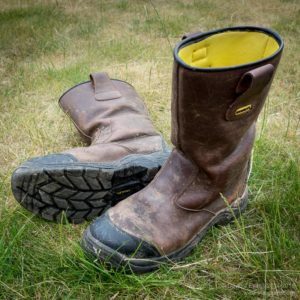 Safety boots only have a 6 month manufacturers guarantee (due to the steel toecaps). Boots wear out – at least as safety equipment they are zero VAT rated.